Hi there! Today's post is about validating email address in php. Yep! I know it's for novice and validating email-id is one of the primitive tasks for a developer to learn. Just in case you don't know, this is not about checking if an email address actually exists in real or not (that's entirely a different thing) but make sure it is well-formed and follows valid format. There is not one but several ways to make sure if an email address is valid and comply with the standard RFC format. So How to Validate Email Address in PHP? Here I'll show you two different methods to validate email address in php. The first method is by using filter_var() function and the second one by using regex pattern. This is the absolute easiest way by which you can validate an email address in php. The method uses PHP's filter_var() function which is simple and safe to check if an email id is well formed and valid. The only downside to this method is it works only with PHP >= v5.2.0. Below is the php function to validate email address using filter_var(). If your PHP version is less than 5.2.0, then you have to go with the (crazy) regular expression method to validate the email address. Here is the php function to check if email-id is valid or not using regular expressions. By using the above two methods you can easily validate the email address in php but still using filter_var() is the best option in most of the cases. I hope you find this tutorial useful! Please let me know your queries through comments. Great post ! To make successful email address there is need to verify email address. Your technique is useful to validate email address in php. 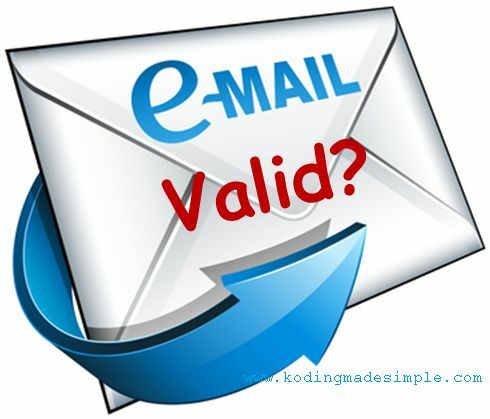 Get best features to verify & check email list address by Email Validation services.